We take a lot of things for granted. Uh, like rain. Long ago, I learned that just because my cenizo blooms, it doesn’t mean rain: it’s just humid. This time, it wasn’t even that humid. It was just time to show off, especially after that one precious rain we got. But when I started gardening, it would have been as rare as rain to find a cenizo in a nursery. Commonly called Texas sage, originally we knew it for its lavender flowers. Now, you can find many bloom colors on cultivars that promote very silvery leaves or a smaller growth habit. Along with native plants and their spin-offs, there have been lots of significant changes in garden philosophy since 1980 when Cheryl Hazeltine and Joan Filvaroff first published The Central Texas Gardener. In 1999, Cheryl and Barry Lovelace updated it as The New Central Texas Gardener. In fall 2010, Texas A&M University Press released this expanded and updated resource, filled with color pictures taken by Cheryl’s husband, Richard, along with bullet points and highlighted tips. It’s classy! In this fabulous resource, written from a “done this” perspective, Cheryl guides us with on-target information about soil, insects, design, vegetables, xeric ornamental plants and trees. And her book isn’t just new: so is her information about techniques, from lawn aeration to soil preservation. She notes the “tried and true” practices that no longer have credence– and the ones that do. I really love the URLS that Cheryl includes in each chapter to spare you some search time. Online search is a great resource, as long as you end up at a trusted site! Otherwise, it’s just like 1980 and you wind up with info best applied in Virginia. Even in 1980, we relied on our Extension Service for information. Now, it’s even easier online. You can also link to your county Texas AgriLife Extension site for specific guides for your area. Cheryl illustrates how gardeners are getting braver to express their personalities with curb beds, hardscape, and other designs, rather than plopping everything up against the house and calling it a day. She explains how far we’ve come in sensitivity to our soil, our true “foundation planting.” And instead of “one size fits all,” we’ve come to understand the essential connection between soil, site, and plant. As a new gardener, I headed for the plants that reminded me of childhood. We all do. And often, it’s hard to face the facts. But instead of gardenias, now I bliss in the spring fragrance of star jasmine. I never knew turks cap as a child, but I relish its flowers that attract hummingbirds that I never met personally until they came to my patio. Now, every child can have this experience, since you can buy turks caps at every nursery, thanks to many sources who brought native plants into mainstream nursery growing. We’ve learned that a good squish is more satisfactory than something that upsets the natural garden balance and our safety. Why would anyone use a product that says, “Keep children and pets away for 24 hours? !” And that includes organic products, like pyrethrum. With Tom, Cheryl says it best : “In fact, you go out and say, what’s wrong with my button bush? Nobody is eating it! And once you get to that point you’re thinking entirely differently about the appearance of the landscape.” Indeed. Instead of static gardens in a perpetual state of tidiness, we relish plant diversity and its kaleidoscope, sometimes messy. Instead of thinking “mess” when plants go to seed, like my rain lilies, we patiently await the day that seeds ripen to increase our collection. Or we’re joyous that birds nab them for dinner and do the spreading for us. Water is a huge issue (and don’t we know it!). But in 1980, gardeners grumbled about drought years and then plied an extravagant hose. Not only has the cost, along with community restrictions, pushed us to waterwise plants, we’ve also become sensitive about a limited resource. On tour, meet Michael McNichol, who embraced the philosophy of sustainability and respect for resources when he built his house and garden for wife Stacy and their young child. And when I say built, I mean it: he did most of it himself! During construction of their energy efficient home (before the birth of their son), he and Stacy lived in their Airstream. For house and garden, Michael pulled from his bank account of innovation, hard work, and sensitivity to resources rather than a ton of money. A lot of the materials are recycled finds, and most of the plants are passalongs from sharing gardeners. Michael’s philosophy and creative ideas will launch us out our summer doldrums, for sure! Many thanks to Sherry Cordry who “passed along” this garden discovery! Another change since 1980: gardeners pile on the mulch. Sure, it’s not a new concept, but somewhere along the way, gardeners decided everything had to be “tidy,” quickly scraping off fallen leaves from any bed. It’s nature’s way to renew the soil, so why not go for this free, positively sustainable technique? But if we want to buy mulch for a tidy look, what is the best one? And how do we do it correctly? This week, Daphne has the answers. When buying mulch, it doesn’t matter if it’s cedar or hardwood. But, it’s best to select one that’s shredded or a small aggregate. Avoid those large bark chips, except for walkways. I’ve always heard that they were “roach motels.” Absolutely avoid cocoa mulch, which is fatal to dogs, and totally not a sustainable product for Central Texas. And one thing we’ve learned: don’t cram it up against your plants and especially your trees. Leave some breathing room at the stems and trunks. This is especially important around trees. This fall, Trisha’s going to give us “5 Tips to Kill Your Trees.” So, that’s a sneak preview. Daphne’s Plant of the Week is an A&M Texas Superstar, angelonia. I tried one this year and it is great! I’ve heard from other gardeners who testify to its long performance in long heat. So, I plan to add a bundle of them next late spring. Certainly, ponds, birdbaths, and fountains have been around for a long time. But over the years, they’ve become more mainstream as we acknowledge their holistic role in our garden habitats. 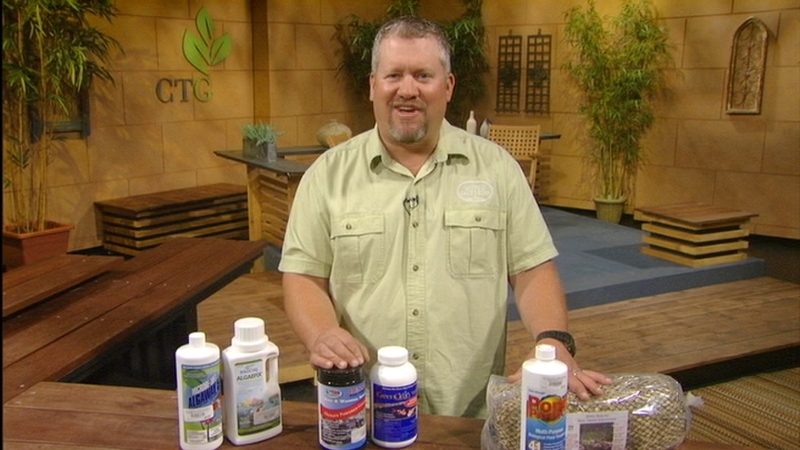 Since algae has been around a long time, too, Steve Kainer from Hill Country Water Gardens & Nursery illustrates how to control and prevent it. And not since 1980, but since last weekend, CTG has a Facebook page! Come on over & check it out! ← CTG has another face on Facebook!